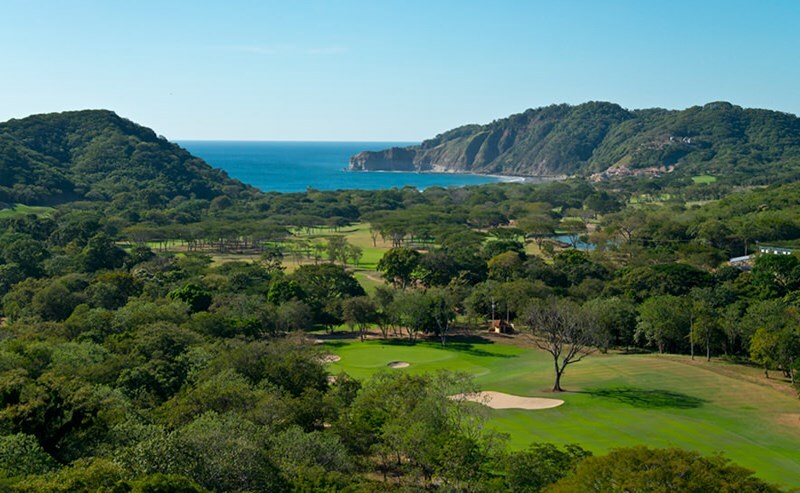 Out of the lush rainforest and rugged ocean bluffs comes a David McLay Kidd signature oceanfront 18-hole course meeting world standards never before attempted in Nicaragua. 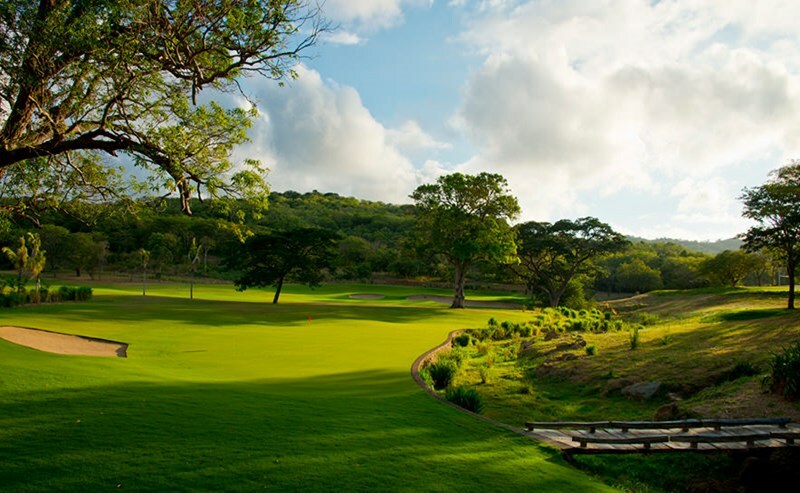 A challenge to players of all skill levels, Guacalito Golf Course seamlessly melds Mother Nature's contours of terrain while at the same time, preserving the delicate, breathtaking environment that makes Nicaragua's Emerald Coast special. Beautiful hardwood bridges made with fallen timber grace many holes. A special treated-water irrigation system keeps with the resort's commitment to sustainability. And the course's finishing hole, an unconventional par-3, was designed specifically to save mature trees instead of removing them. This hole sets the tone of the Golf course experience by giving the player a look at 2 monumental trees and an arroyo, predominant themes throughout the course. The trees not only add to the spectacular views but become part of the game. A slight dogleg left with a large receptive green, generous bail out space to the right of the green and bunker trouble on the left. A straight forward tee shot with ample landing area, testing your iron skills on the second shot into a raised green with a false front and bunkers on the left. 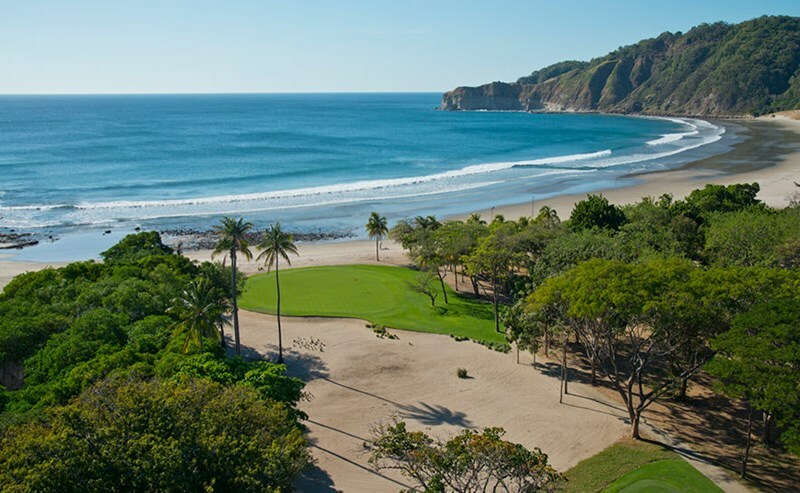 When you are on the green enjoy a glimpse of Mukul´s beautiful villas and the ocean. Exotic flora adorns the tee box to this downhill par 3. Don´t let the wind drift your ball to the right where there is trouble, use the sloped bank on the left to feed your ball onto the green. 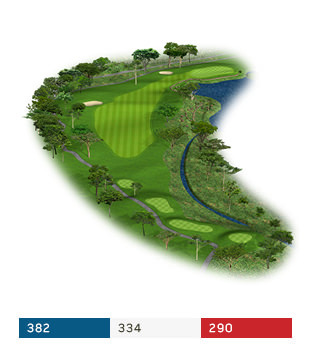 Two arroyos need to be considered in your strategy while playing this par 5. Make sure your tee shot favors the right side of the fairway or the monumental tree on the left will demand some shot shaping on next stroke. The green is protected in the front by an arroyo, to right with a bunker and lots of trouble if your ball goes off the back. Visually intimidating from the tee box, this dogleg left has wider landing area than meets the eye. A large green needs to be aggressively attacked, keeping the bunkers on the right out of play. What looks like an easy short par 3 can rapidly turn into a high number on the scorecard as the green runs up to a walled arroyo with a subtly placed greenside bunker in the back. 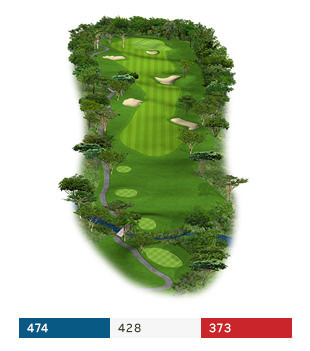 A straight par 5 peppered with fairway bunkers demanding smart ball placement off the tee box. Going for it in two will require finesse in order to stay out of trouble around the green. Superb golf hole, proper club selection a must throughout. A short par 4 with another green protected by an arroyo in front and a monumental tree looming to the left. If your tee shot goes left you will need to get the ball up in the air to clear the tree and if you go right you better have a good knock down shot in your bag. Enjoy the handmade hanging bridge which leads you to the green. The lake hole. Not too much trouble off the tee box, it’s the second shot where it gets tricky. The green runs right up to the lake, so even if you are cautious and stay left you can chip it right back into the lake. "Don't be tempted to cut the corner, place your drive near the bunker out to the left. A lot of visual noise off the tee box, trees on the left and strategically placed bunkers down the middle and right. 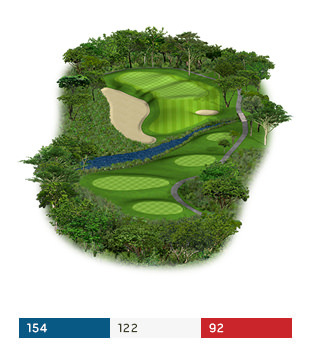 This is a soft par 5 with plenty of opportunity to score well. Aesthetically pleasing to the eye, not so for the golf ball. An arroyo is placed right across the landing area with a long uphill second shot into a well protected and sloping green. Good club selection is key on this dramatically downhill par 3. Trees guard the hole on both sides with a large bunker in front. Long is much better than short. Generous spaces on this hole allow you to play into the green from 2 different perspectives, the lowland on the left and the highland on the right, split down the middle by another monumental tree. Dogleg right, sets up well for a power fade off the tee box. The second shot plays into a raised green with the rain forest in the background. Something different; long par 3 into an enormous green split down the middle by a severe valley, commonly known as a Biarritz green. Getting up and down in 3 will be memorable. Two arroyos, a dogleg right and a raised green with sharp drop off to the right into a bunker; this one requires you to think before reaching into the bag. Downhill with bunkers all the way down the middle, you can either bail out to the right or try and squeeze a drive down the left. This hole begs you to go for it! Surf´s up! A great way to end this unique experience on a par 3 right into the Pacific Ocean, the green literally runs onto the beach. Tough to gauge the right club with a waste bunker running straight from the tee box up to the front of the green and wind from behind. 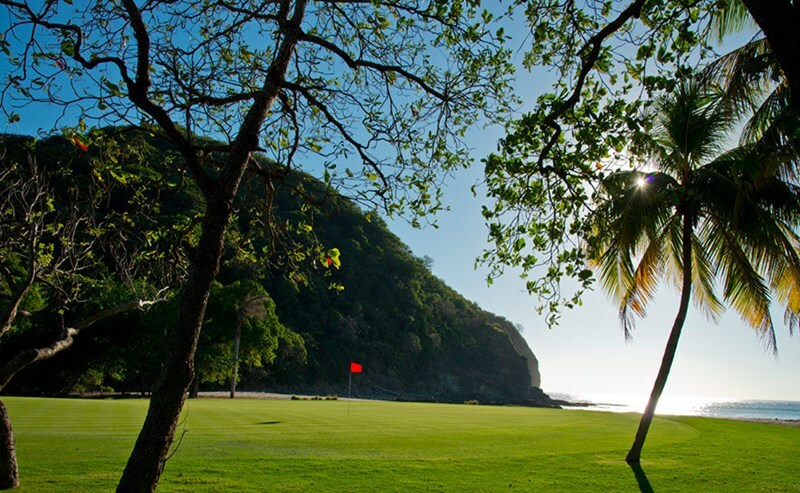 The beauty of this hole is that you will want to kick your shoes off and jump in the water with a refreshing rum drink in hand!